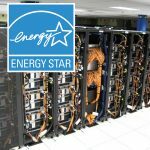 UW Tower Data Center earned ENERGY STAR certification for the sixth year in a row, a claim no other university in the country can make. The award recognizes superior energy efficiency and reduced carbon footprint. The data center is a centrally managed, secure facility powered and cooled without interruption, 24 hours a day, 365 days a year. It houses the computer, storage and networks that are the backbone for the UW’s administrative, academic and research computing systems.